Note about the word, “Maundy”: It is derived from the Latin “mandatum”, or commandment (as in “mandate”). On this 1st of the 3 days of our salvation, the Lord Jesus gave 2 commandments. 1. When He washed His disciples feet He said, A new commandment that you love one another. The sense of the Greek is that the new commandment is SO THAT you love another, which would mean the new commandment is to wash each other’s feet. IN that way we love each other and show forth His love to all. 2. When He broke the bread and gave the Cup, He gave us His body and blood with the words, “Do this”. The Holy Communion is not optional, but a command. In Jewish tradition the 2 candles on the dining table represent: Command and Remembrance. Yes! “Do this, in remembrance of Me.” As we are serve one another the Lord serves us His Body and Blood till He comes again in glory. 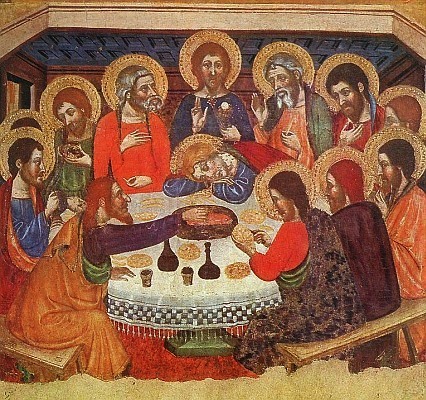 His Church is called to serve the Dinner: the Holy Communion, the Lord’s Supper, the Mass and serve one another. The two sets of readings for this holy day are about the vertical and horizontal dimension of the Holy Communion of the Church: kneeling to receive the Sacrament of the Altar and kneeling to wash each other’s feet. 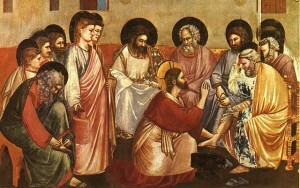 In many of the icons of the Lord washing Peter’s feet, Peter has his hand to his forehead as if he saying, “Oh, my!”. This is the Lord who knelt to wash His disciples feet. The Lord who knelt to feed us His Body and Blood. The Lord who knelt in prayer. He calls us to Himself as His kneeling Church. O Lord, in this wondrous Sacrament You have left us a remembrance of Your passion. Grant that we may so receive the sacred mystery of Your body and blood that the fruits of Your redemption may continually be manifest in us; for You live and reign with the Father and the Holy Spirit, one God, now and forever.